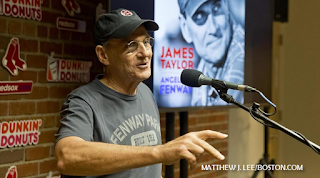 cryptonaut-in-exile: Red Sox host James Taylor in effort to reach out to young fans. 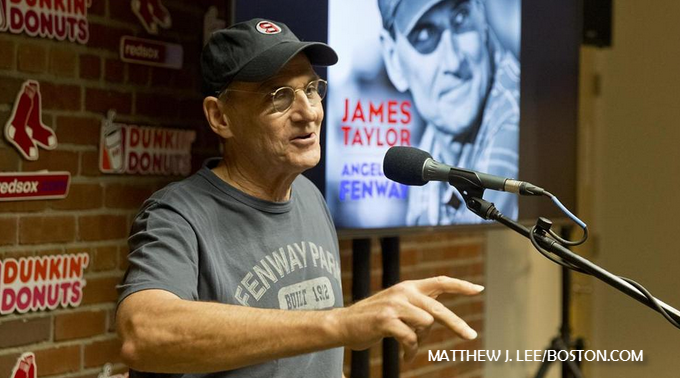 Red Sox host James Taylor in effort to reach out to young fans. The tune tells the tale of several generations of Red Sox fans, and muses on the Curse of the Bambino, the Yankees rivalry, and the historic 2004 World Series win, which inspired the song. The Rock and Roll Hall of Famer, who is a longtime Sox fan, held a press conference prior to the game, playing the video and discussing the song’s origins. Remember the Chris Rock segment on how baseball is screwing itself by its constant outreach to aging, white dudes? Apparently the Red Sox don't. Boston must also have some hip hop performers they could be partnering with to make sure it's not only Big Papi we ever hear rap? Speaking of, where's Moufy at these days? Isn't Guru from Boston? Has Edo G got any prodigies? I don't know, maybe there's a dearth of talent in Boston -- historically not the most nurturing city for young black performers, I suppose. But kids in Boston must like music from somewhere? Is it that the biggest stars regionally are based out of New York and we can't have Mets or Yankees caps showing up to see music at Fenway, or worn by the performers? What about Michael Christmas?